Generative Flowers II was was created for an outdoor installation at Victory Plaza in Downtown Dallas Texas. Victory Plaza has a 50×30 ft HD super screen they intend to show works from an international array of video and new media artists. Basically the program generates really colorful video by running color fills through animated grayscale masks of flowers then applying video feedback. The color fills and certain portions of the animation are unpredictable. Some procedural processes are employed that sample the animation as it is being generated. In its pure state as a piece of software it is designed to never generate the same video twice or loop. 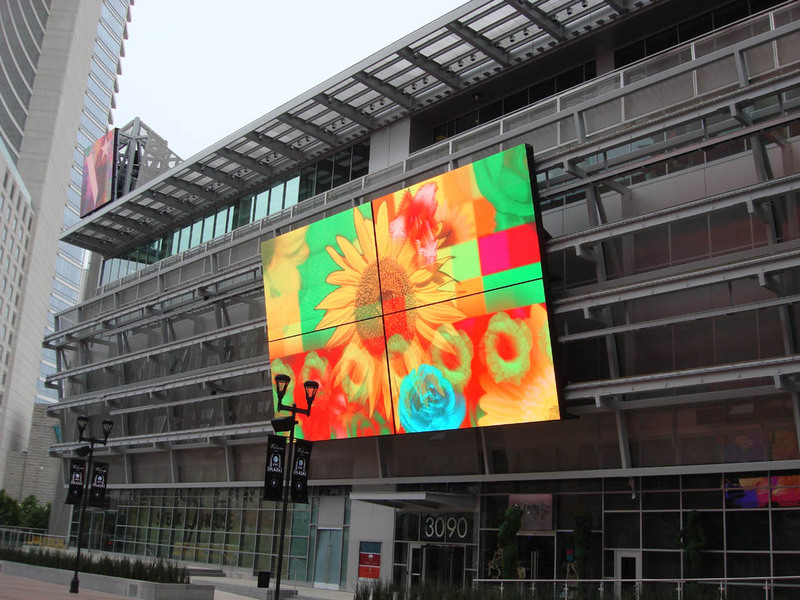 For Victory Media Network I chose a specific order for the central flowers since there are two screens facing each other across a courtyard. The videos should appear closely synchronized but different at the same time. Generative Flowers II was created, programmed and scored by Don Relyea. Mark Charneski photographed and scanned the original flowers. The flowers are drawn using imaging lingo by performing a color fill through a grayscale alpha channel extracted from a masked photo of a flower species. All the flower objects select their colors arbitrarily from a set color lookup table. The flowers on the corners select their alpha channels arbitrarily as well. Since the installation space has two huge HD screens facing each other across a courtyard I wanted the two screens have different yet connected video. So the central flower alpha channel is chosen incrementally making the central flower species a common thread between the two videos. The flowers are always drawing on screen every frame with 5-10% transparency so if things draw over them they fade back in over what has just been drawn. The procedural effects objects then perform a pixel sampling and drawing function on a screen grab of what is below that instant. The object divides the screen into a grid and samples colors from inside each square. Every iteration it fills a square smaller than than the one before in arbitrary increments. This creates multicolored concentric squares from the surrounding color scheme. 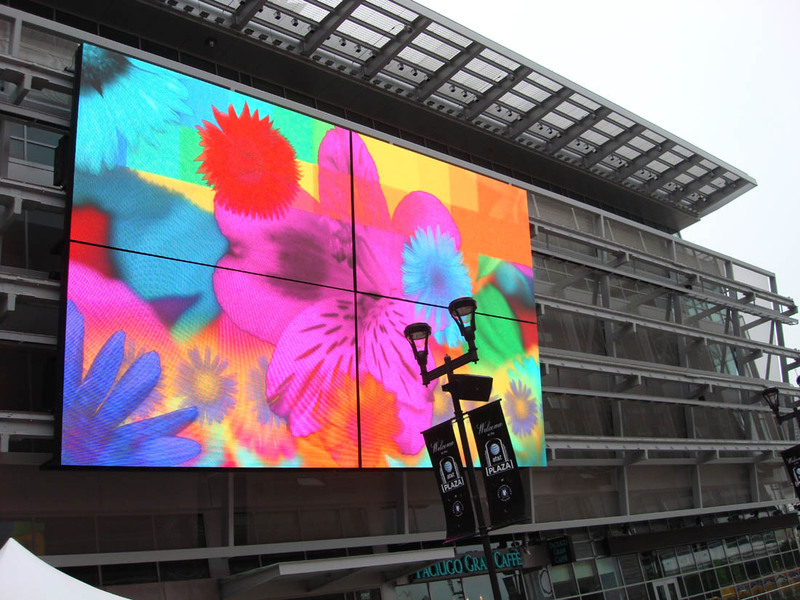 There is a similar video sampling function at Victory Plaza which samples pixels from the video playing in real time and projects the same colors as ambient lighting from lights across the top of the buildings. The combination of the 2 procedural effects caused a colored light wave to happen with the ambient lighting. Lastly there is a slight vector distort applied with transparency over the whole frame that causes what has been drawn previously to blur into the background adding a sense of depth. The program runs in real time in standard NTSC or PAL resolution but a renderer had to be implemented for the HD output. I used Werner Sharp’s Image Export Extra to render out all the frames as PNG files and re-assembled them in post production.